Using Farm Food Rawhide Dental Chips contributes to good oral hygiene for dogs in a natural way. Dogs have a natural urge to chew. They do this to keep their teeth clean, and it reduces the risk of dental problems. In the wild, dogs' ancestors would chew the hide of animals they had hunted. Pet dogs don? generally catch their own food, but Farm Food have come up with an alternative. 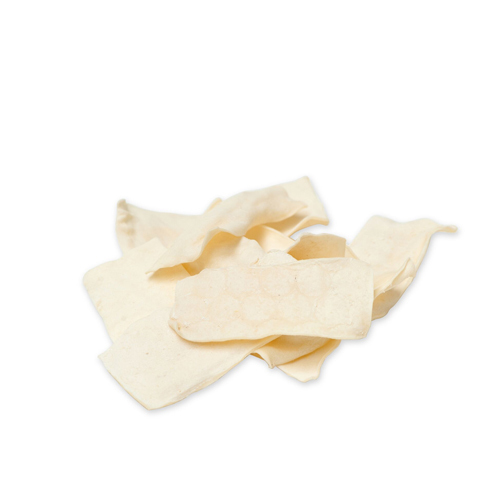 The Farm Food Rawhide Dental Chips consist of dried subcutaneous connective tissue of cows (the second solid and tough layer of cowskin) which is ideal to give to your dog as something to satisfy his cravings to chew. Residue food particles can cause bad breath and plaque. This plaque is responsible for tartar on the dog's teeth. In severe cases the plaque can cause gum disease, leading to possible infections and loss of teeth. When your dog chews on these chips, collagen is mixed with the canine saliva. This protein is an endogenous compound which fights plaque on the teeth. In addition, there is a scouring action of the material on the teeth which ensures a thorough and visible clean of your dog's teeth. Have you used Farm Food Rawhide Dental Chips before? Let us know what you think about this product. My mum buys these for me cos they’re not bleached and cos they keep me teefs clean and me breffs fresh. Plus she says they keeps me quiet so she can haff some peas and quiet. I had been buying a cheaper version of rawhide strips for my greyhound but when I read somewhere about bleach and other nasties being used during processing I looked for an alternative and found these, hurrah! These chews are great, my girl loves them and they are helping to keep her teeth clean and breath fresh. I cannot fault them, they leave no odour or stains on her bedding and she loves them. Farmfood rawhide dental chews. My two dogs love them! And I'm happy that the chews contain no nasty chemicals. The first thing I noticed is they smell & look natural ( unlike the stuff I had been buying!) .